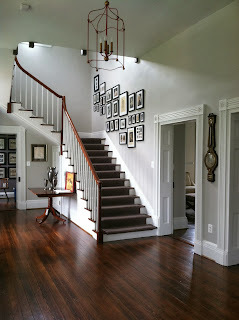 In the past year I have restored several pieces for a home in Jefferson County, West Virginia called Cedar Lawn. to view more posts concerning this home, please click on the label "Cedar Lawn". 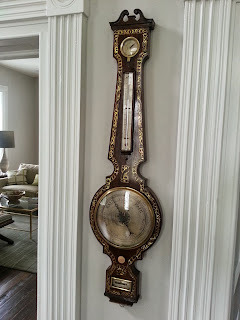 It is possible that this barometer was made by someone else, or that it was made for a retailer that chose not to have the companies name on the case. Another possibility is that it had a paper label that is now lost. 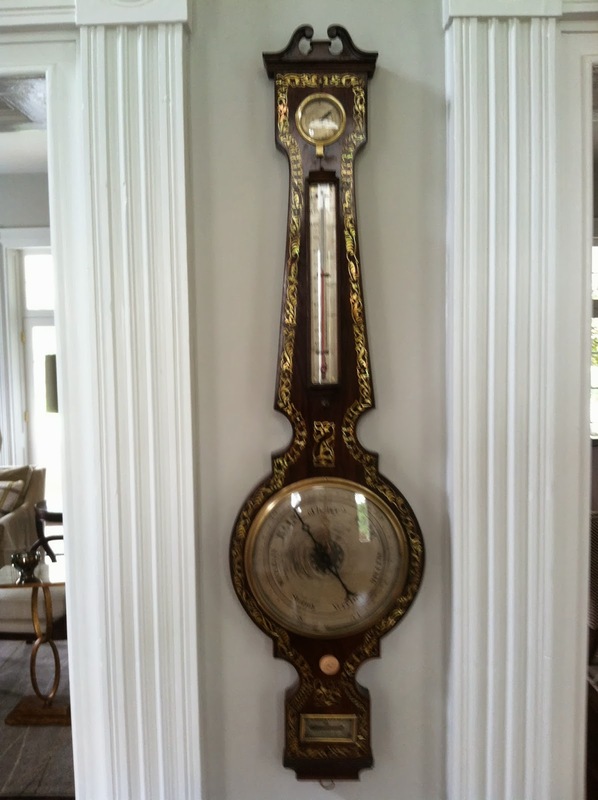 At any rate, It is most likely that this barometer was made by or for Negretti and Zambra. 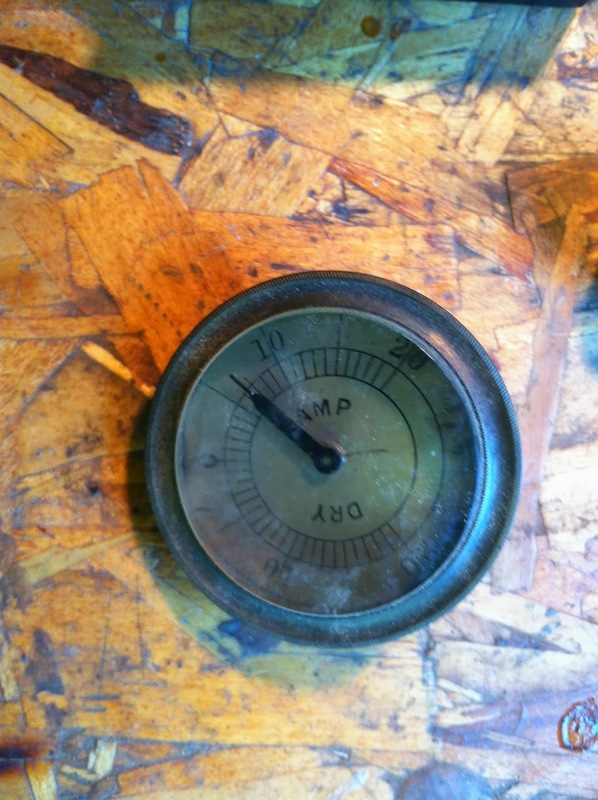 The barometer had many condition issues when it came to the shop. 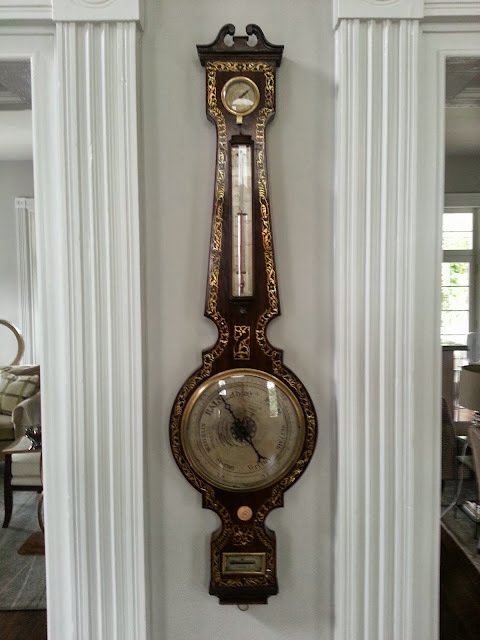 The convex bezel glass that housed the silvered hydrometer dial was missing as was the curved rectangular glass housing the thermometer. The case itself had loose veneer and was missing part of the mahogany crown molding. In addition to all of this, the thermometer glass was cracked and the barometer tubes in the back were also cracked. 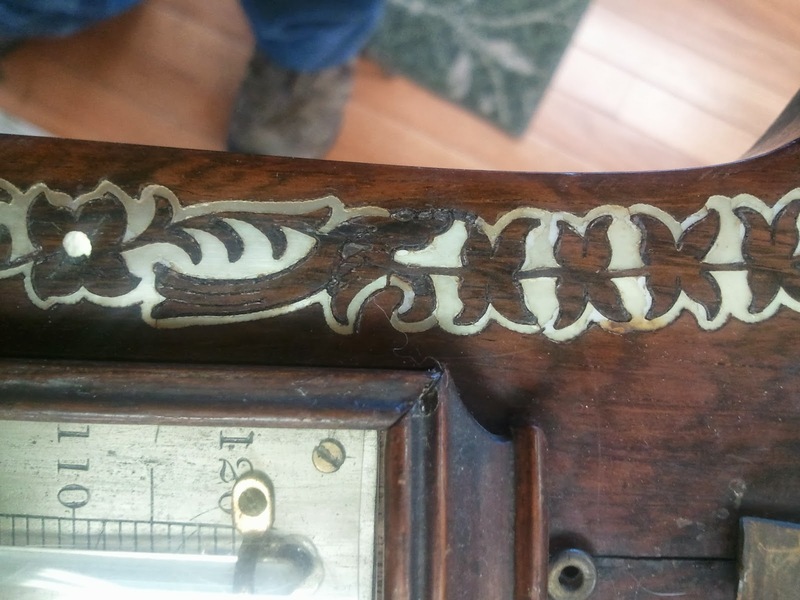 The replacement glass was custom made by Carter Holder,of New Port Richie, Florida, who is as far as I know the only person in the country who can make this type of glass. 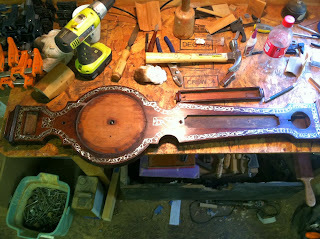 The result was quite beautiful to behold and was of fine craftsmanship. The barometer tubes were replaced by Eastern Standard Time, of Purcellville, VA. All other work was done in house and can be seen in the photos below. 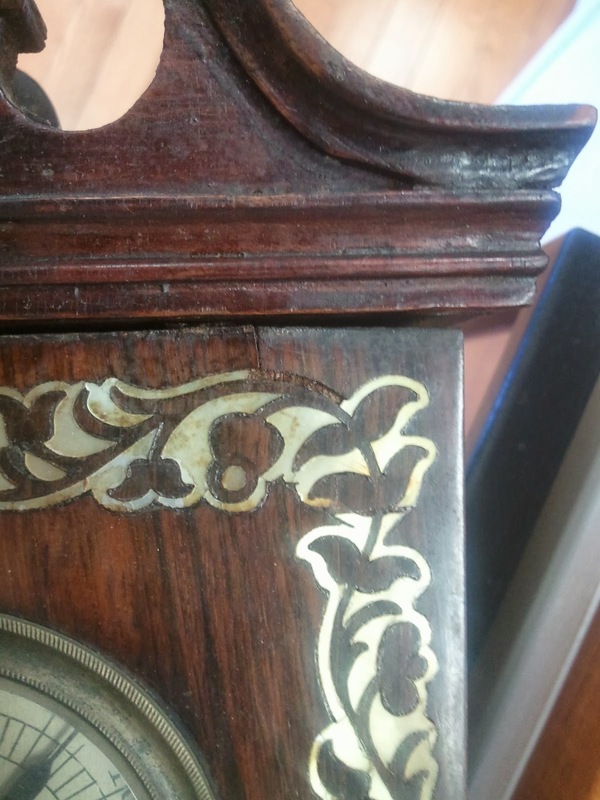 These first few photos show the condition of the case when it arrived in the shop. 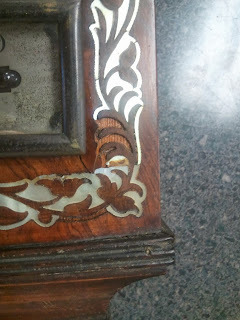 Note the missing mother of pearl in each photo. Replacement pieces were carefully cut using a jeweler's saw and glued in place using hide glue. All of the loose rosewood veneer was also glued down using hide glue, an appropriate glue for such work. 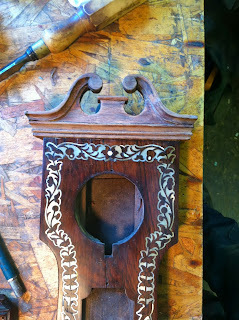 Below is a the replaced section of crown molding carved out of mahogany, like the original. It was later stained to match the color of the rosewood the way the original section would have been stained. 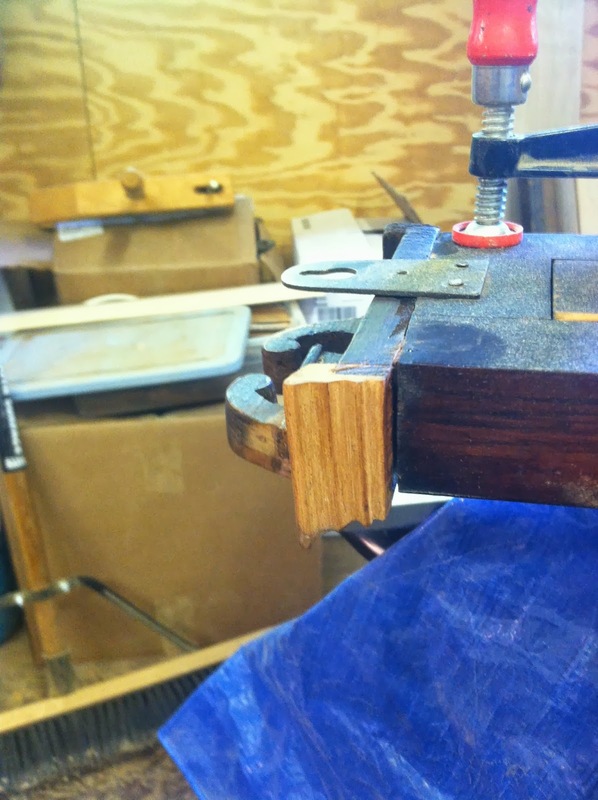 These next two photos show some clamping operations in which loose veneer was glued down and replacement inlay was glued in place. 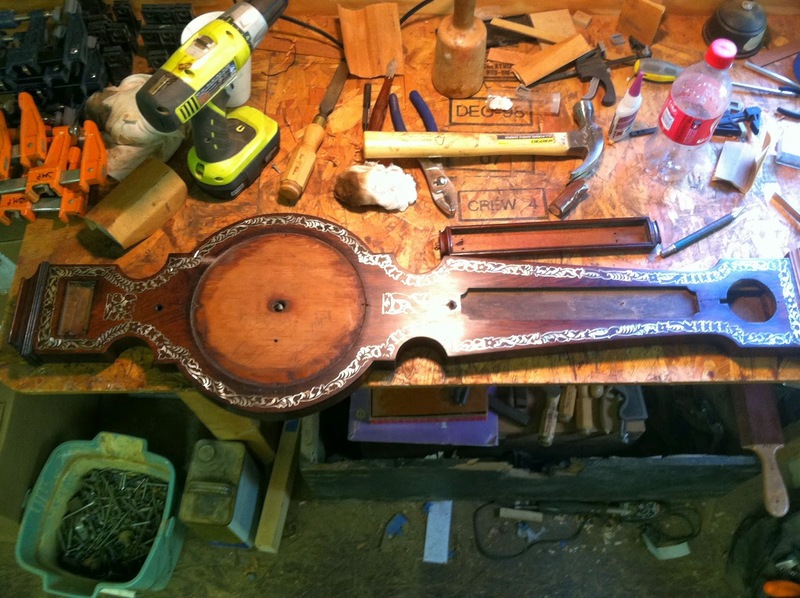 The finish on the mahogany pediment was in very bad shape and could not be restored, so it was removed and replaced with a french polish. The finish on the rest of the case was restored and French polish was added to the original finish. the pediment can be seen with the finish removed in the photo below. 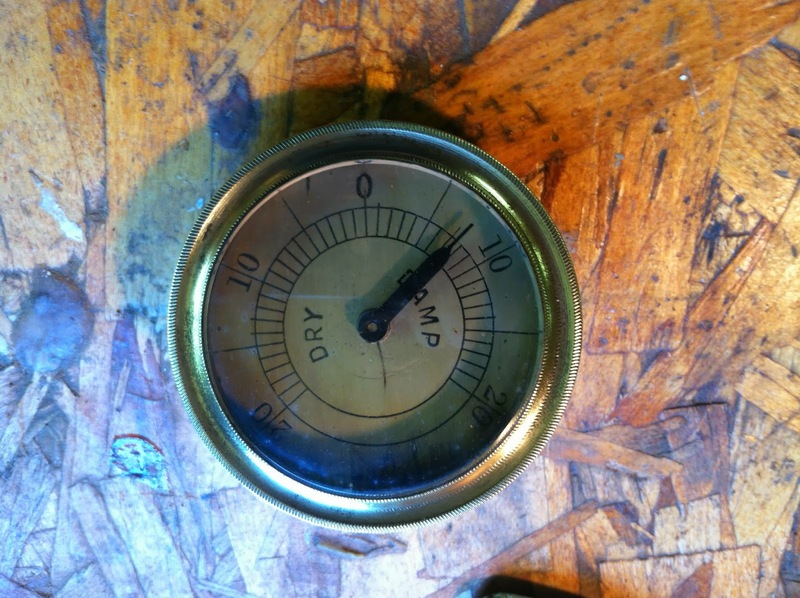 You might notice that the example I linked to above has a brass finial. I saw no evidence of a finial on the pediment so decided not to put one on. 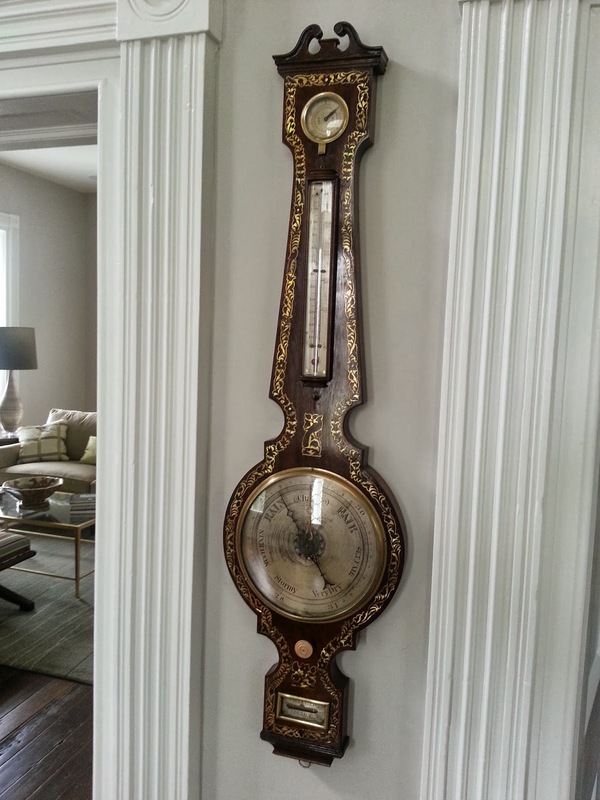 This shot shows the barometer case with the various instruments removed. 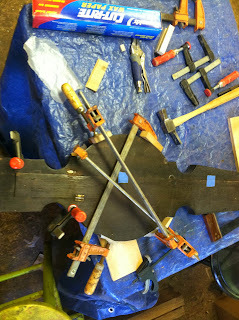 The tools used to repair the case are seen scattered around on the bench. 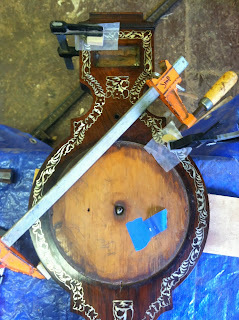 Before installing the various instruments, all of the glass was cleaned and the brass surrounds were polished. Below are two photos of the damp gauge before and after cleaning. 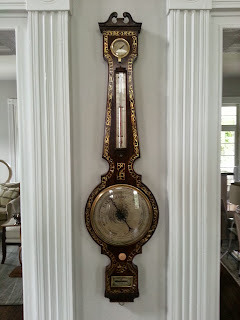 These last few shots show the completed barometer hanging in Cedar Lawn.